An international mission investigating the human rights conditions of the Arab citizens in the Naqab begins its work today, Sunday, 8 March 2009. The mission's goal is to illuminate the facts of Arab rights to land ownership, adequate housing ad services, and the violation of those rights. The fact-finding team is comprised of prominent experts in the fields of human rights, physical planning, international law and indigenous peoples affairs. The team includes experts from Europe, the Americas, Asia and Africa, as well as a local team of experts. The Regional Council for the Unrecognized Villages of al-Naqab (RCUV) has been working for over a year to prepare for this mission. Due to political constraints, however, the RCUV's work has been discrete, but running parallel to the highly publicized Goldberg Commission. The Israeli Knesset formed that Commission to advise the government on the establishment of what is described as an "Authority for Regulating the Settlement of Bedouin in the Negev." 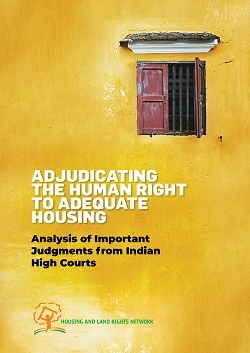 The Housing and Land Rights Network of the Habitat International Coalition, a global alliance operating to defense housing and land rights for over 30 years, has worked in cooperation with the RCUV to plan and select international experts for this investigative task. The announcement of the fact-finding mission has been delayed until the mission's work begins, in order to avoid official interference that would impede the mission. Following considerable study of the situation in al-Naqab by way of documentary sources, the fact-finding mission team has begun its in-country work this morning. To provide for verification of findings, the program will involve several site visits with Arab land owners, displaced and dispossessed persons through Saturday. The mission will end by issuing a set of preliminary findings and recommendation at the end of the visit, and issue its full report in the near future. The RCUV considers the timing of this mission to be especially auspicious, given the current formation of the far-right government in Israel, and while the people of al-Naqab have suffered from serial deceptions by governments that have claimed to seek a just solution to the issue of Arab lands and the recognition of the "unrecognized" villages. In fact, the State only seeks further confiscation of Arab lands in al-Naqab and to continue dismissing and denying services to some 46 "unrecognized" villages. The RCUV sees the Goldberg Commission's recommendations as the confirmation of its worst fears, demonstrating that its purpose is no less that to serve as an instrument of more government pressure to seize as much Arab land as possible in al-Naqab for the settlement of another one million Jewish settlers. •	Rudolfo Stavenhagen, former UN Special Rapporteur on the situation of the human rights and fundamental freedoms of indigenous people (2001–08) and Mexican sociologist and professor at Colégio de México (Mexico City). •	Suhad Bishara, lawyer with Adalah: The Legal Centre for Arab Minority Rights in Israel. 8. Submit recommendations concerning any discriminatory policies with regard to land confiscation, house demolition, denial of services and affecting the essentials of life and livelihood.